Dr. Rioseco reaches a career defining milestone as he becomes an Accredited Member of the American Academy of Cosmetic Dentistry. West Harrison, NY—At the 35th annual American Academy of Cosmetic Dentistry (AACD) Scientific Session in San Diego, California, Westchester cosmetic dentist Robert Rioseco, DDS will become an Accredited Member of the AACD along with seven of his esteemed colleagues. AACD Accreditation is thus far the capstone achievement of Dr. Rioseco’s decades-long career at The Center for Cosmetic Dentistry. The AACD’s Scientific Session is the pinnacle event of the year for cosmetic dentists, as it is one of the largest conferences attended by dentists from around the world. This gathering offers a packed schedule of educational lectures and presentations that largely focus on the latest treatment and technology advancements in aesthetic dentistry. 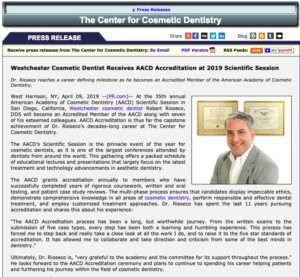 Ultimately, Dr. Rioseco is, “very grateful to the academy and the committee for its support throughout the process.” He looks forward to the AACD Accreditation ceremony and plans to continue to spending his career helping patients and furthering his journey within the field of cosmetic dentistry. Dr. Rioseco is a leading cosmetic and restorative dentist in West Harrison, New York with more than 30 years of experience. As the Director of The Center for Cosmetic Dentistry, Dr. Riosco operates a state-of-the-art dental practice and a teaching facility for other dentists. A graduate of Boston College (undergraduate) and Tufts University School of Medicine and Dentistry, Dr. Rioseco has been distinguished among his peers as an Accredited Member of the AACD and a Fellow of the Academy of General Dentistry. Both honors reflect his commitment to the field of dentistry and dedication to continuing education coursework. Dr. Rioseco is an active member of the American Dental Association, American Academy of Cosmetic Dentistry, Academy of General Dentistry, and the Empire State Academy of Cosmetic Dentistry. He is available for interview upon request. For more information about Dr. Rioseco and his practice, please visit zendentist.com and facebook.com/TheCenterForCosmeticDentistry.